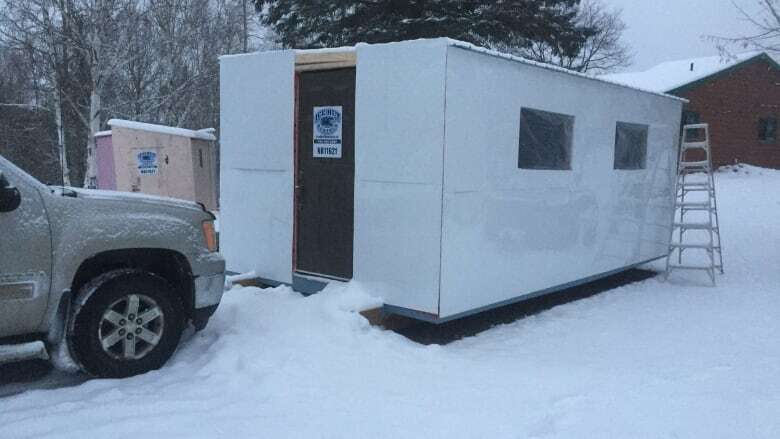 A company promoting ice hut rentals near North Bay, Ont., has sparked controversy over a Kijiji ad that said status card holders were not welcome. 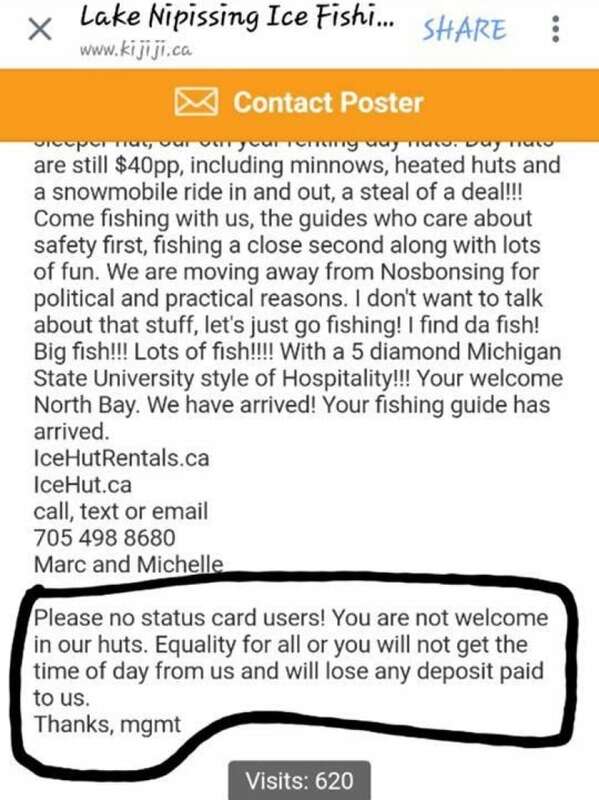 A Kijiji ad posted by the company Ice Hut Rentals stated status card users are not welcome. A company promoting ice hut rentals near North Bay, Ont., has sparked controversy over a Kijiji advertisement that said status card holders were not welcome. "It's just a blatant racist statement," said Les Couchi, who's from Nipissing First Nation. "There's no two ways about it." The post was uploaded by IceHutRentals.ca earlier this week. The ad originally said status card users will lose their deposits and will "not get the time of day." "I've seen lots of stuff in my 60 years of existence on the planet, but nothing as overt as this," Couchi said. "This is just ... being as ignorant as you can." More text from the original Kijiji ad by the company Ice Hut Rentals. Couchi was notified about the ad by Tom, whose last name is being withheld because he fears there will be repercussions for speaking out. Tom, who lives in the North Bay area, found the post while searching for ice hut rentals on Lake Nipissing. "It just blew me away," Tom said. "I've never seen anything like that posted before." The ad also caught the attention of avid fisherman Sean Voldock from Renfrew County. Voldock insists the sentiment in the ad does not reflect Ontario's ice fishing community. "He [company owner] doesn't own the laws and the lake," Voldock said. "I don't understand his thinking." Many people on Facebook have called for the company to be shut down or boycotted. CBC News contacted the company for comment, but did not receive a reply. IceHutRentals.ca had issued an apology on Facebook on Tuesday. The apology had said:"Everyone is welcome at our huts on Sunset Point, Lake Nipissing. "We sincerely apologize for any hurt feelings and confusion our poorly worded ad has caused."